Need an evergreen border shrub for a skinny space? The tall and slender profile of Euonymus ‘Green Spire’ is an attractive and elegant specimen for tight, narrow spaces in the landscape. Plants are suited to a variety of landscape styles including formal, smaller urban, and woodland gardens. The dense, dark green foliage of Euonymus ‘Green Spire’ keeps the landscape rich in texture and color year-round. Branches grow in a narrow upright pattern. Use ‘Green Spire’ as a screen to cover unsightly fences, reduce noise and offer privacy. Looks wonderful as a focal point in tight spaces or as upright anchor plants in foundation beds. You can also plant ‘Green Spire’ in large containers to flank an entryway or make a pathway. 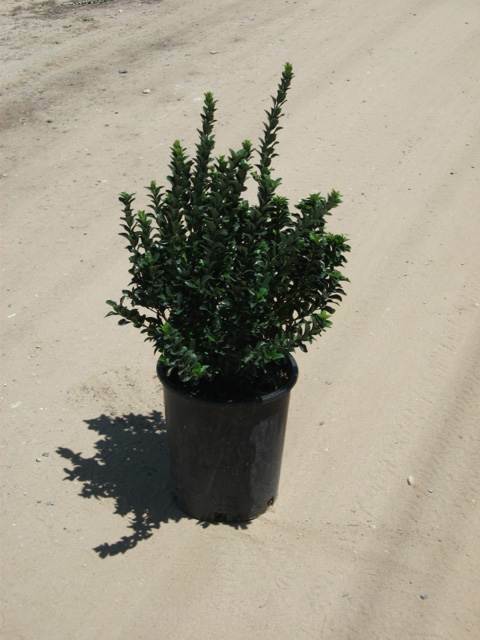 This low maintenance shrub is very tolerant of many soil conditions and environments, but performs best in rich, well draining soil in a sunny location. ‘Green Spire’ very tolerant of a variety of pests and diseases. Plants look their best with consistent moisture throughout the year and may need supplemental water during hot summers.